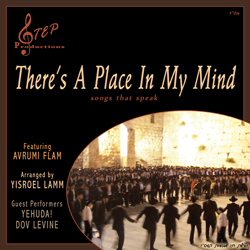 Presenting the first of STEProduction’s albums: THERE’S A PLACE IN MY MIND, songs that penetrate the depths of the Neshama, starring Avrumi Flam, who has magnificently pulled together this tremendous production. Although these songs have been very popular for many years, they were never released to the public before. This new release, sung by Avrumi Flam along with with Yehuda! and Dov Levine, is now available to the entire listening population. The need for Jewish music with themes that are educational, build character and strengthen yiras shomayim is crucial. We look forward to sharing over 35 years of songs written by Mrs. Dina Storch with the special engineers who have been part of it and those who are new to it. This CD will be available from MostlyMusic.com very soon. Larry: Tried to contact you directly regarding your comment but the email address you supplied us with is bogus. If you’d like to discuss this NOT in a public forum, please feel free to contact me at kolisha1@gmail.com. Please assume that in the future any other comments that come from a bogus email address will just be deleted. whats the words to the leible song??????? Who is singing the first song please?